Wild Pen is an handwritten typeface created by Manuel Eduardo Corradine and published by Corradine Fonts that has Spontaneous Styles and automatic Smart Replacement. It contains Set of Five Basic Fonts and Open Type users mat try Wild Pen OT. Alternative character and discretionary ligatures are only available in Wild Pen OT. Also it has language support (many Latin language). Try them all! 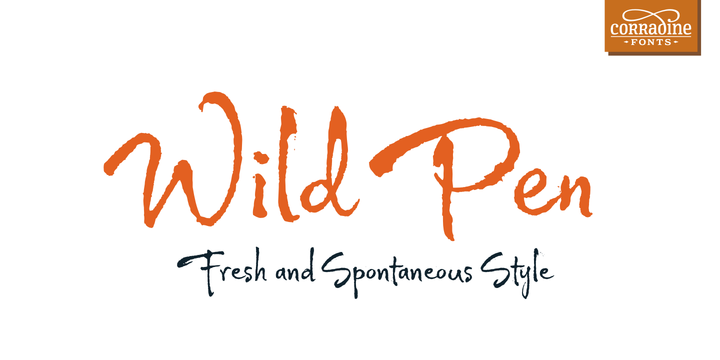 Trademark: “Wild Pen” is a trademark name of Corradine Font. A font description published on Tuesday, May 13th, 2014 in Corradine Fonts, Fonts, Manuel Eduardo Corradine by Alexandra that has 5,065 views.